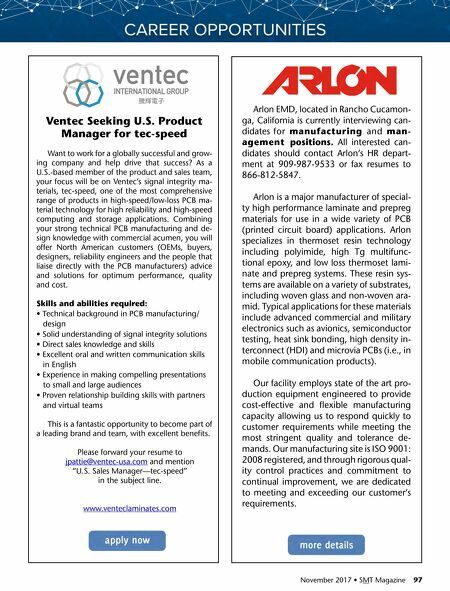 96 SMT Magazine • November 2017 PCB Assembly Supervisor— full time Accurate Circuit Engineering— Santa Ana, CA Position Summary: Responsible for all assembly processes to ensure continued growth as directed by management. Essential Job Functions: • Create, implement, and supervise in-house manufacturing facility • Recruit, hire, train, and supervise assembly floor personnel • Extensive hands on experience with all aspects of PCB assembly • Understanding of IPC-A-610 standards • Research and acquire additional assembly resources • Gather data on product shortages, lead times, price changes, etc. • Coordinate the assembly activities with sales to ensure 100% on-time delivery • Create, implement, and supervise daily quality processes to ensure 100% accuracy • Document, monitor and review progress of the business unit • Respond to internal and external customers in a timely manner • Coordinate walk-through, site audits, etc. Qualifications: • Minimum 3 years as operations supervisor of electronics assembly house • 5+ years' experience in the electronics industry • Previous experience as a quality or operations supervisor preferred • Ability to solve practical problems using pre-established guidelines • Strong facility in Microsoft Office applications • Excellent verbal and written communication skills • Ability to work with people of diverse backgrounds • Highly organized/excellent time management skills • Ability to perform at the highest level in a fast-paced environment • Valid California driver's license. PCB Process Planner Accurate Circuit Engineering (ACE) is an ISO 9001:2000 certified manufacturer of high-quality PCB prototypes and low-volume production for companies who demand the highest quality in the shortest time possible. 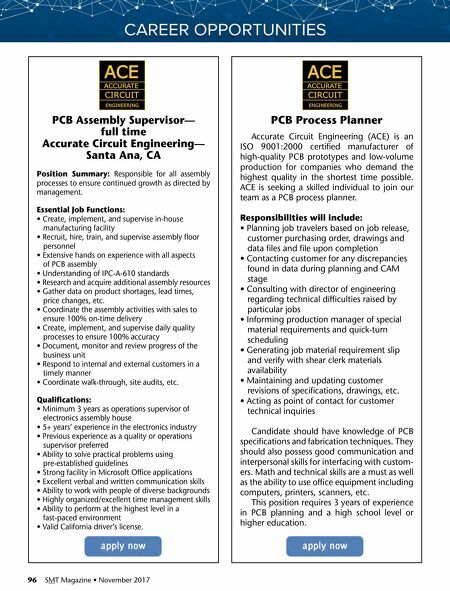 ACE is seeking a skilled individual to join our team as a PCB process planner. Responsibilities will include: • Planning job travelers based on job release, customer purchasing order, drawings and data files and file upon completion • Contacting customer for any discrepancies found in data during planning and CAM stage • Consulting with director of engineering regarding technical difficulties raised by particular jobs • Informing production manager of special material requirements and quick-turn scheduling • Generating job material requirement slip and verify with shear clerk materials availability • Maintaining and updating customer revisions of specifications, drawings, etc. • Acting as point of contact for customer technical inquiries Candidate should have knowledge of PCB specifications and fabrication techniques. They should also possess good communication and interpersonal skills for interfacing with custom - ers. Math and technical skills are a must as well as the ability to use office equipment including computers, printers, scanners, etc. This position requires 3 years of experience in PCB planning and a high school level or higher education.